With the 3rd iteration of the Disney Infinity sets arriving on Friday, we provide you with a handy guide detailing what you need to buy if you own previous sets. Disney Infinity 3.0 is the third major set to arrive from Disney featuring a mix of toys and game that interact with each other. While this new trend (started by Activision’s Skylanders) is a fantastic idea that kids and adults love, it can also prove expensive and confusing as new toys and sets are released that only work with certain versions of the game. This Friday (28th August) sees the release of Disney Infinity 3.0. As the name suggests, it’s the third set the series with its own software and playsets that will only work with 3.0. The first Disney Infinity (which we’ll call 1.0) was themed around standard Disney licences and included Sully, Mr Incredible and Captain Jack Sparrow from Pirates of the Caribbean, as well as a playset piece that unlocks the main game. Each character had a unique world within the single playset piece that only characters from that franchise can use, so the rest of the Incredibles family can be used in the Incredibles game etc. In addition to this, each version of the game comes with what Disney call a ‘Toy Box’ which allows you to build your own worlds from basic building materials (think Minecraft but more basic) and use any characters from Infinity 1.0 to play around in. Add ons come in the form of plastic discs, usually bought as ‘blind-bags’ so you don’t know what you’re getting, which add powers, features and items to the game. The second game featured Marvel’s Avengers, with extra playsets and characters adding further Marvel and Disney franchises like Spider-man, Guardians of the Galaxy and Mickey Mouse to the game. As with the first set, Infinity 2.0 comes with 3 characters; Thor, Black Widow and Iron Man. It only has one game, with an Avengers Tower game piece unlocking it, based around The Avengers, but more games are unlocked by buying further playsets. The base in this game (the plastic board that the characters stand on to interact with the game) is exactly the same as in the first game. The new game, which arrives on Friday, is themed around Star Wars (specifically the Clone Wars cartoon shown on Disney Channel) and only comes with 2 playable characters. The set piece unlocks a game based on this franchise with more characters available to buy separately. An Inside Out playset will also be available at launch that will unlock a new game world and features Joy and Anger toys. There will be more playsets available by the end of the year, including a classic Star Wars set with Luke and Leia toys and a Death Star Playset piece. Again, the Disney Infinity 3.0 set has the same base as the previous games. The most important element of the game is the base, which comes in all the package boxes. This plugs in to the console and allows you to place characters on it to interact with the game. It also has a space for a playset piece to unlock that playset game. The base has remained the same in all versions of the game, so if you already own the base you can buy the game digitally or buy a cheaper set that features the game disc and characters. If you buy the software on its own (digitally or via disc) you won’t be able to play the main game without the playset piece or a character toy. Bases are also cross compatible on most consoles, but not for Xbox 360 or Xbox One. The Wii, Wii U, PS3 and PS4 bases will all work on these machines. The Xbox 360 base will only work on that console and that goes for the Xbox One base. Figures and playsets are also cross compatible with every console, though figures from the latest set will not work on previous sets, so Infinity 2.0 characters will not work on Infinity 1.0 and Infinity 3.0 figures will not work with Infinity 1.0 or 2.0. Figures from previous sets will work on newer versions of the game in Toy Box mode, though Playset pieces will not work with other versions of the game. Each pack or figure is clearly marked with the version number in the corner (as you can see on the left), so it’s worth taking note of this if buying a Playset. 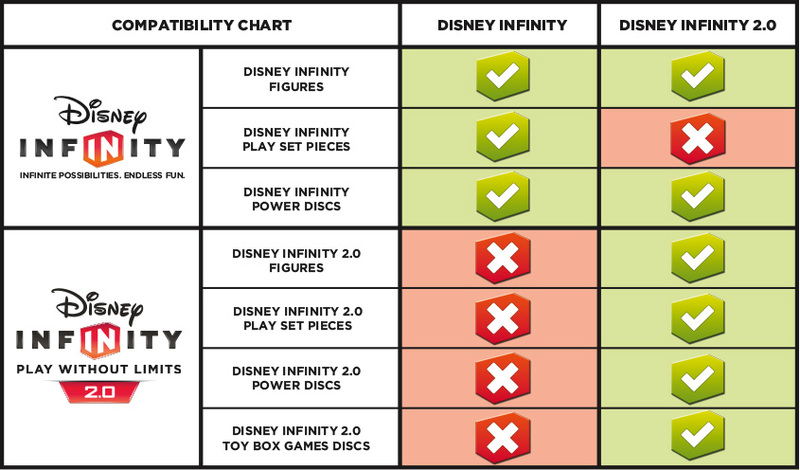 Disney have put together a compatibility chart for Infinity 1.0 and 2.0. We’re expecting them to add a new 3.0 version of this soon, but the same rules apply for 1.0 and 2.0 to Infinity 3.0 as between 1.0 and 2.0 figures and playsets. If you’re thinking of buying the new Disney Infinity 3.0 set and already own either of the other sets then there are options to save you some hard earned cash. With Infinity 3.0 Disney have released options for buying the starter pack in different ways. This comes with figures, game and base for each platform, as well as a playset piece and extra tokens. Some stores, like Amazon, are offering a Toy Box Takeover piece as an incentive for pre-ordering. The second option, which works out around £30-£35, is to buy the disc and figures with a playset piece, but without the base. This shaves around £10 off the starter pack price and is a useful alternative if you already own a previous set. Lastly, the disc only option (around £25) is there for those who want to buy the set in pieces or buy the Inside Out playset and don’t have an interest in Star Wars. This is simply just the disc and playsets/figures need to be bought separately to get any use from it. You have mɑde ѕome rеally good points there.